Deciding how to allocate funds among debt paydown, saving for college, and building your retirement account is hard. Which comes first? Can you do all three at once? Should you focus on one or two at a time and delay the other(s). The approach you take depends on several factors. In this post, we will explore what it may depend on. Keep this in mind, too. Paying off debt can be a wise thing to do. It can increase your net worth – the difference between what you own (your assets) and what you owe (your liabilities). Investing is also important. In general, it builds your net worth, too. One of these is not necessarily wrong and the other right. · What will future interest rates be? · How will your income change over time? · How many children will you have? · Where will your child(ren) go to college? · How much will college cost? · How will medical costs change over time? · How long will you live? · How will your housing costs change over time? · Where will you live when you retire? · How many grandchildren will you have and how much support will you provide them? · What will your healthcare costs and needs be? · Will you be physically able to do what you want when you retire? · Will your risk tolerance change over time? · What level of returns will your investments generate? · What will future tax rates be? Ideally, we want to allocate our cash to all three accounts. In our house, we have four kids – the oldest is a college junior. Our choice – all three. Let’s explore why. Especially when we are young, it can be hard to think about saving for a retirement that is many years away. Unfortunately, this may cause us to delay saving for retirement. But, waiting can materially impact the size of our nest egg. 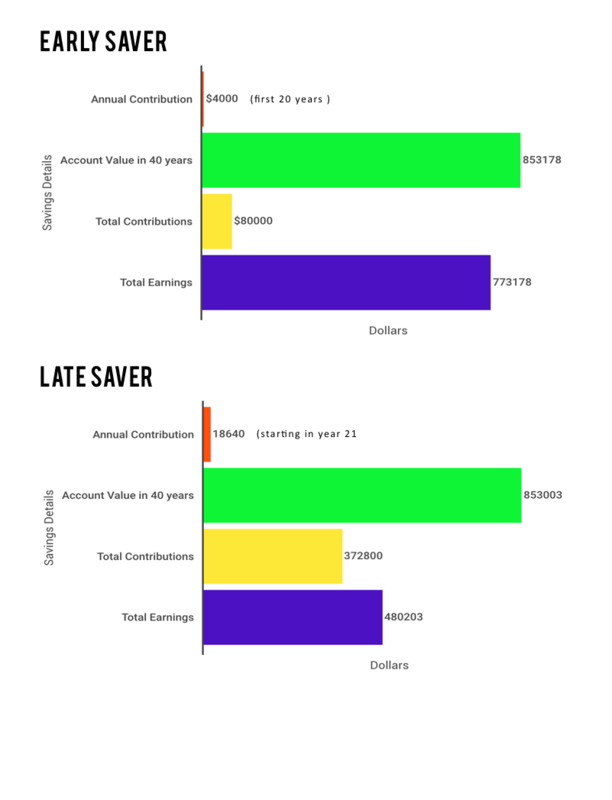 Let's take an example: say you start saving at age 25 and contribute $4,000 a year for 20 years earning an annualized average rate of 8%, then stop adding to your account but continuing to compound at 8% annually. At age 65, you will have $853,178. In this example, you will have contributed $80,000 ($4,000 per year for 20 years) and earned $773,178, almost ten-times what you invested. Instead, assume you delayed saving, putting away nothing from the ages of 25-45. To have roughly the same amount at 65 as the early saver, you will have to invest about $18,640 per year using the same 8% annual return assumption. 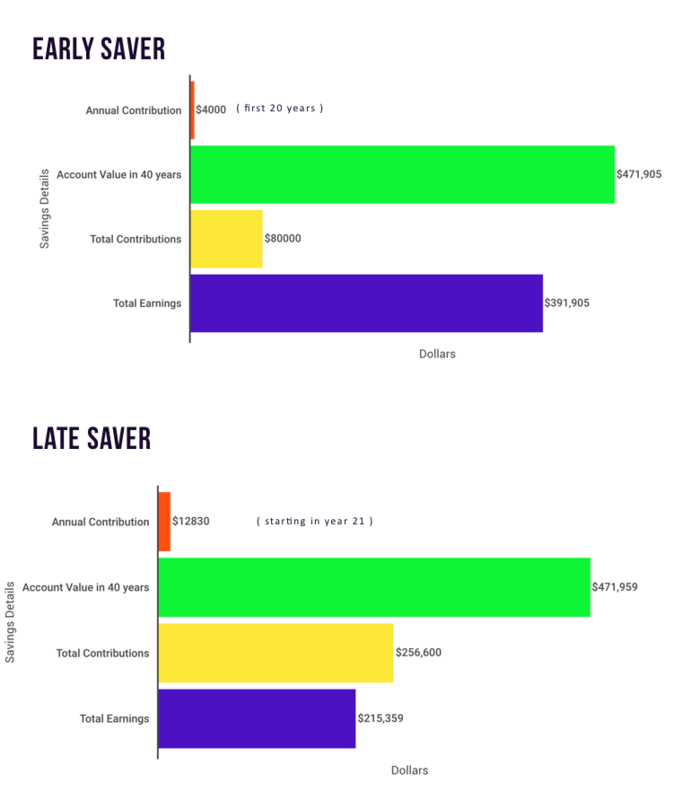 You will contribute a vastly larger sum of $372,800 over twenty years, almost five-fold the early saver's total contribution. The point isn't HOW MUCH you start with, rather that you begin saving immediately to take advantage of the compounding effect of earnings. For illustrative purposes a second scenario, compounding at 6% is provided. At the end of 40 years, you will still save a lot more if you start early. However, the lower rate of return means your account will be worth a lot less. The moral – it pays to start early. Time in the market truly matters. Another factor. When you retire, you will find it difficult to borrow if you need to fund unforeseen expenses or if you have not saved enough. It can be hard to find a bank that will lend money to someone without any income. It is a lot easier to borrow when you are working or when you have collateral the lender can use to help assure repayment. Borrowing money to fund college costs is generally easier than borrowing money when you are retired. When you save for retirement, you are paying yourself. You are taking a portion of today’s income and investing it for the future so that you can have money to live on when you stop working. For many employees, paying yourself this way has another HUGE advantage. If you receive an employer match, take advantage of it. For example, if you get a 3% match if you put away 6% of your pay, then save at least 6% of your pay. The 3% employer match equates to a 50% guaranteed return on your investment (3% is half of 6%). Earlier we assumed a 6% long-term average rate of return on your investment, which pales in comparison to 50%. Especially, if that 50% is guaranteed. There is no way you can guarantee yourself a 50% return by anything else you do. If you fail to take advantage of this match, you are also leaving a portion of your salary on the table. In almost any circumstance, you should contribute at least enough to your retirement account to benefit from the maximum employer match of your retirement plan contributions. If you have significant amounts of high-interest credit card debt, repaying it should be a priority. The interest rate on many credit cards can be 15% or higher. The interest you pay on your credit cards is not tax deductible. Paying interest to your credit card company on your balance to invest in the market is not good for your financial health. No matter how well the market has done, or how well you think it might do, you cannot be sure that you will earn a return greater than what you will save by repaying debt. On the other hand, if you have a mortgage, it is a little trickier. Mortgage interest rates are much lower than credit card interest rates as well as compared to historical norms – I remember how pleased I was when the mortgage rate on the first home I purchased was 6.375%. That sure looks high today. While recent tax law changes will potentially reduce the amount of mortgage interest you can deduct, if you itemize your deductions, you should still be able to claim a tax benefit. For example, assume you borrow $500,000 for 30 years at 4.25%. In the first year, you will pay roughly $22,000 of deductible mortgage interest expense. Since you can deduct the interest, it will cost you less than 4.25%. If you are in the 24% bracket, the after-tax cost of your interest will be 3.23%. The one thing we often forget is how much we pay in interest over the life of a loan though. If the $500,000 loan discussed above was paid off over 30 years, the total amount of interest paid would be nearly $400,000. This does not mean we should not take out a mortgage. It is just a reminder that borrowing has a cost. Saving for college is important. Most of us want to provide our children with every opportunity to succeed that we can. The cost of college attendance keeps increasing, too, so putting money away now for an obligation that will be payable in the future makes sense. Hopefully, the growth of what we save will be greater than the rate at which college costs inflate. For those that have not looked recently, the elite private institutions cost more than $60,000 per year. The best state schools cost around $25,000 for in-state students. College is expensive. In the past, we discussed some ways to improve your student’s chances of receiving financial aid or scholarships. Future posts will also discuss ways to save for college. One of the best approaches is to contribute money to a 529 College Savings Plan. In many states, residents can deduct such contributions from their taxable income. In our view, we should try investing for retirement while also paying down debts and saving for college. However, we can also provide a suggested hierarchy that can help with the decision-making process as you try to balance how to allocate your funds. 1. Make sure to get any employer match for your retirement savings contributions. Failing to do so is leaving a portion of your salary on the table. 2. Pay off high-interest rate debt of 8% or more. This is a relatively high rate of return on your investment. It is also a guaranteed rate. 3. Contribute as much as you reasonably can to your retirement or investment accounts and save for college as appropriate. It makes sense to try and strike a balance here. Allocate funds to different accounts. 4. Pay down low-rate debt, particularly if you have an aversion to debt. Note that if you have a mortgage, always do your best to keep your account in good standing. The amount referred to here is excess principal payments out of any amounts remaining after the above items have been funded. No matter how intelligent and educated we are, we are not typically conversant enough with financial matters to be able to see when one expert’s advice conflicts with another. An advisor who is conversant with all aspects of the client’s life – not just their finances – can help by keeping the bigger picture in mind. At Apprise Wealth Management, we take a holistic approach to financial planning, helping to make sure each part of the plan is designed to work harmoniously with the others. A holistic financial plan views all aspects of the client’s financial life as part of a unified whole. If you would like to discuss your personal situation with us in more detail, please complete our Contact Us form. We will be happy to schedule a time to meet with you.